For years I’ve been an android owner and lover, in fact, I owned the first ever android phone (HTC G1) the day it came out back in October 2008. Throughout the years I’ve got so many great deals on apps (and I’m going to concentrate on the app side of it rather than music and movies), and I have bought many apps on a discounted rate or at full price, just recently I purchased the pro version of what I consider a life saver app called “Twilight” which had a few extra features for just $0.99 instead of $3.99 as part of a summer campaign by Google. Now back to this awesome new portal. A couple years back I created a new Gmail account to separate business and personal emails, I even bought a second phone to keep it completely separate, on the new phone, I simply logged in with the new Gmail/Google account and was not able to install the apps I had already paid for from my original account unless I paid for it all over again, of course, all the discounts were gone, and I remember the total was over $400 to re-purchase apps that I’ve already purchased before. The only solution was to login to my old Google account and just download and install all the apps, in order to keep using the apps I had to stay logged in South the original account on the new phone which was supposed to be for personal use. I’ve made a few mistakes not switching back to the personal account, whether on Google docs or drive or whatever. 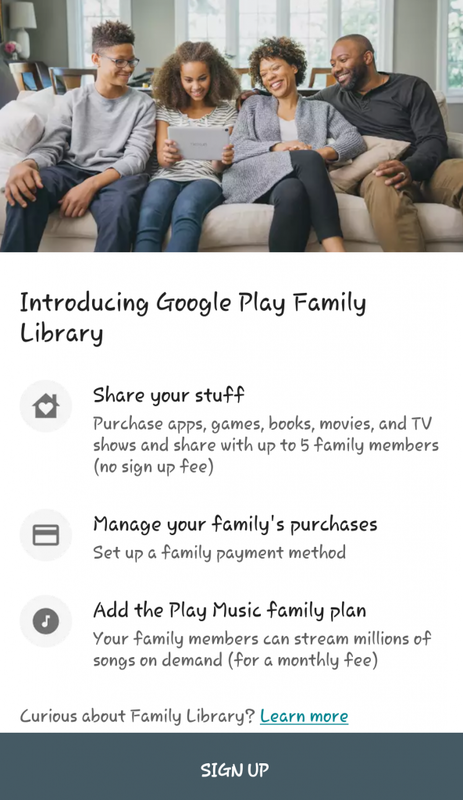 The new Google Play Family Library allows you to share up to 6 accounts with family and allow each account to have the ability to install your purchased apps, music, books and movies. This means I sign up, login from the original account, add the new account and that’s it. Which I did. It literally took less than 2 minutes to have full control over all purchased apps from the original phone to the new phone. Not only that, I suggested a useful app with my wife that would have cost an additional few bucks. Next step, I’m going to sync my music to the new account with Google play music… Wish me luck ??? ?